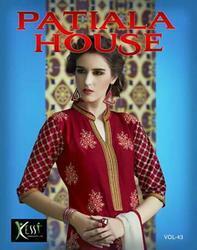 New catalog Patiyala Pari. Decent Style Of Top With Different Style Of DHOTI Patiyala..
With the help of our procuring agents, we have been able to offer our clients with Trendy Patiala Suit. This is sami raw silk material of shirt and semi crape 3 mtr salwar stuff. Sequence bace designer duppatta. . Front neck is handwork. 12 colors r availavle. At wholesale price.